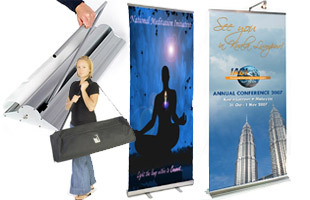 We sell banners to enhance your trade show presentation. Our huge selection of display graphics is growing daily. 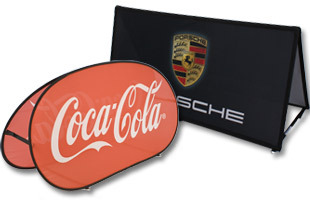 Retractable and scrolling banners add visual impact to your display booth or exhibit, and are easy to transport. 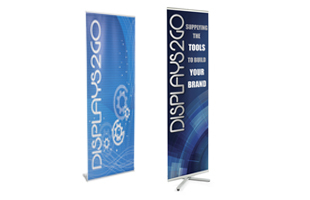 A banner stand helps draw attention to your exhibit by allowing you to place eye popping graphics wherever needed. Lightweight portable displays have been designed with your transportation needs in mind and most come with an easy to carry bag. Most signage is also easy to set up and can be fully assembled in approximately 10 minutes, saving you valuable time. 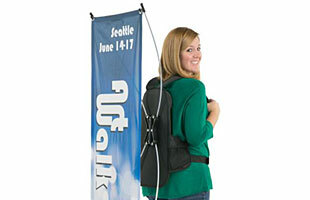 Banners with stands and other graphics aren't just for trade shows. 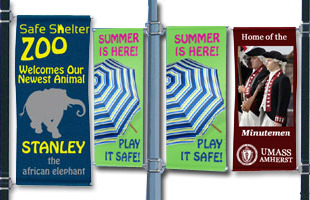 Our outdoor flags are perfect for shops, restaurants, businesses, lobbies and sporting events. 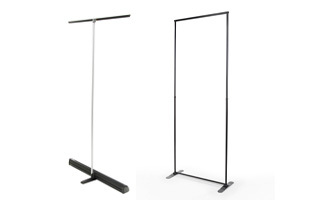 Protected from the elements these sturdy banner stands can withstand most mild inclement weather. 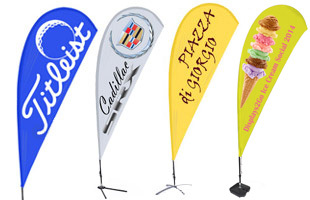 We also provide a wide selection of promotional flags and teardrop flags that have a unique flying effect to draw attention. 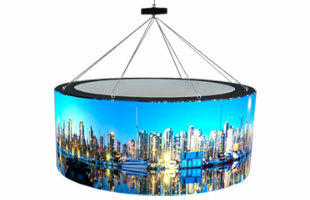 In addition to outdoor displays, we also provide a variety of indoor units as well. 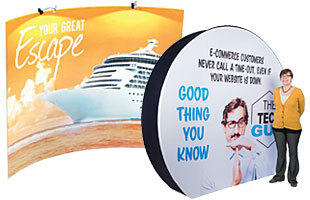 Grab visitors' eye by placing a portable banner stand that scrolls near your booth. The moving display graphics will stop people in their tracks to read it in its entirety. Large hanging streamers also add graphics by suspending in windows, against walls, and from ceilings. Placing such advertising in your customers or clients area promotes brand awareness as well! 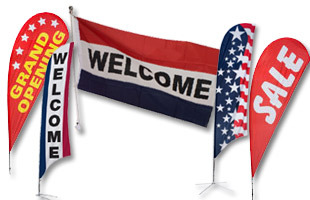 We sell banner stands with custom graphics to every type of store, business, or even government agencies. Our exhibition stands with retractable banners are very easy to store and travel with because the graphics neatly tucked inside the base. These retractable stands keep your display graphics safe from scratches and damage, and are extremely easy to travel with. 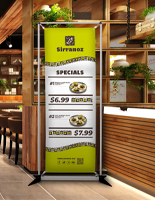 Expand media roll banners provide the highest European quality on the marketplace, featuring innovative designs and stylish constructions. 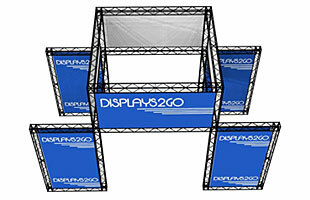 Trade show displays and display booths are hardly complete without custom graphic stands. When you want to create an inviting environment and give your customers a lasting impression remember to use a retractable banner as part of your trade show displays. From a marketing standpoint, no business can survive long without advertising of some sort. With the thousands of POP and trade show displays available, the choices are many but the question still remains: How do I point potential customers to my products or services? That question can be answered with banner displays. 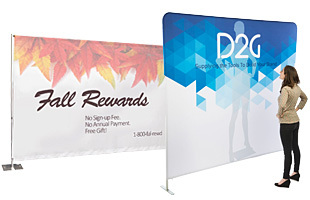 Promotional flags, and human billboards are all types of custom-printed displays designed to create interest and attract people, either to your place of business or trade show booth. More often than not, these products are also reasonably priced. 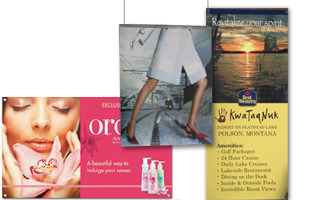 Floor Displays encompass the largest selection of banner products, and there are many varieties to choose from. 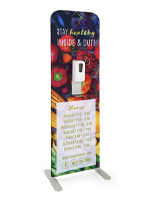 Simple pole stands display your printed graphics with ease and are usually the most affordable type of display. Most handle just one print, but others can display 3 at a time in a 3-sided arrangement. 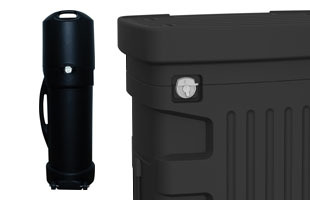 Retractable types go one step further by housing your valuable printed graphics in the spring-loaded base. 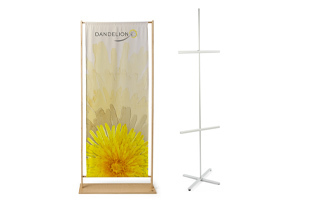 Like pulling on a window shade, the banner is pulled up and out of the base and connects to a pole extending up from behind. Since your graphics are protected inside the base, it brings for peace-of-mind especially during transport or travel. As a result, retractable stands are a little more expensive. Yet another floor stand display is the GiantPole. With graphics displayed at heights of 17 feet, this is the one that gets noticed from far away. 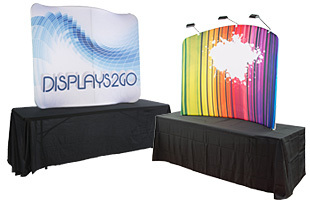 The towering height aids visibility and impact whether outdoors at a public event or indoors across the trade show floor. 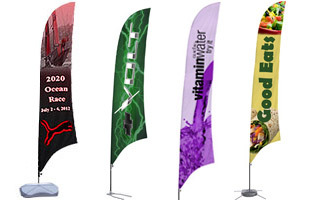 Promotional Flags offer full color graphics printed onto fabric material. 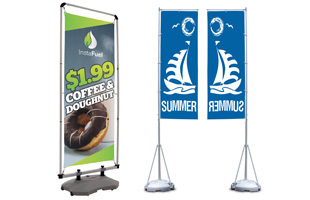 With interesting feather or teardrop shapes, these displays add visual interest to any promotion, especially outdoors. The fact that flags are constantly on the move thanks to the wind happens to be their biggest feature. It's been proven that movement attracts the eye quicker than static advertisements, and flags are a natural for promoting products, services, or public events. 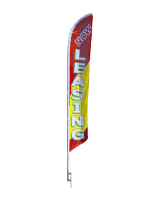 These promotional flags come with platform stands for hard surfaces or ground screws for grass and sand. Ever wonder how these flags are planted in sand at the beach? Ground screws. 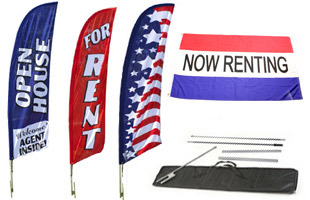 These flags not only flow with the wind but also rotate 360°, the perfect display for any type of promotion.